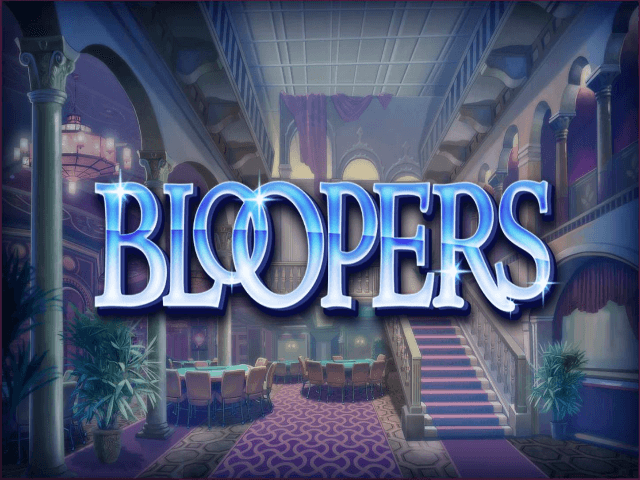 Take a stroll down the red carpet in the Bloopers slot game from ELK Studios. This highly entertaining game sees you spin the reels on the set of a Hollywood production. 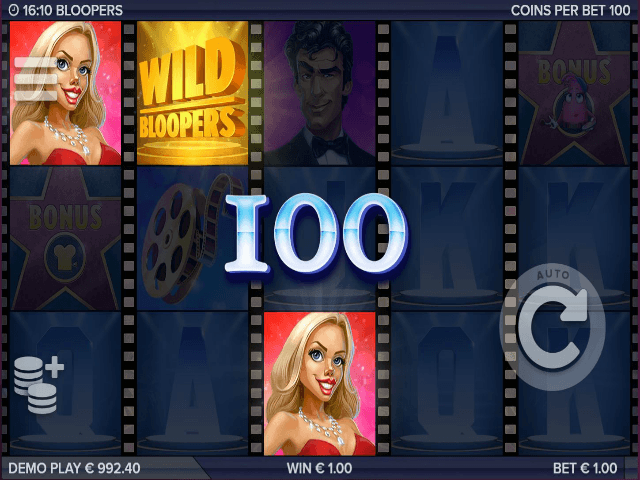 The Bloopers online video slot is played across five reels and three rows with 243 ways to win. 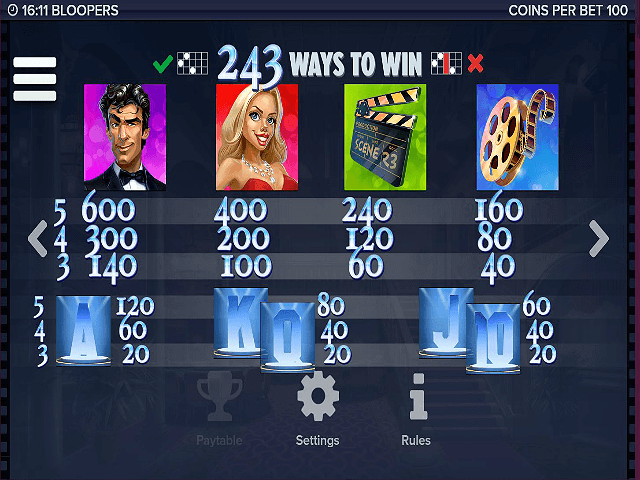 With so many rewarding features that can boost your bankroll, Tinseltown has never been so exciting – you’ll soon feel like a movie star when you razz up the reels of this slot game. 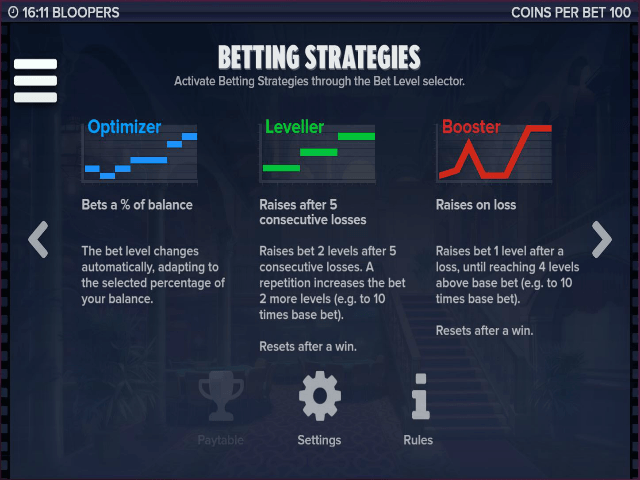 Read all about the Bloopers video slot in this slot guide. Bloopers sets the scene with a short introduction video that introduces the stars that populate the reels. Set against a sophisticated hotel lobby with an orchestral soundtrack playing, the slot reels feature all things moviemaking: clapper boards, a pneumatic blonde and handsome leading men. In terms of jackpots, Bloopers is all about the Free Spins Bonus feature – this is where you’ll bring in those big-budget wins. Alongside these there are Expanding Wilds, falling symbols, random Wilds and plenty more action in this glamorous game. This slot can be played from just 25p all the way up to £100 per spin, has a very decent 96.1% return to player and boasts a huge jackpot of £185,000. And the award for most entertaining slot goes to... you guessed it. Bloopers has plenty of Hollywood action to enjoy with the theme continuing through the reel symbols. The high value symbols are represented by male and female movie stars and the clapper board. While the lower value symbols come in the form of 10, J, Q, K and A symbols. Hit the Wild Bloopers logo to substitute symbols (bar the ‘Walk of Fame’ star symbol). The Hollywood star is the bonus symbol, hit three or more of these and you’ll activate the Free Spins Bonus round. If movie star symbols land on the three middle reels this will switch them to Sticky Wilds. The blue stunt man Blooper will trigger the Expanding Wilds, and the green clapper board brings falling symbols for even more payouts. You’re the star of this slot so there are plenty of Hollywood-style riches for you to stake your claim in. 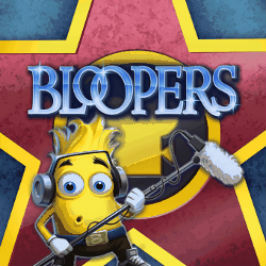 The brightly coloured creatures known as Bloopers will take you to one of five mini-features. These include the Sound Tech game which gives you Sticky Wilds, the Stunt Man that turns Wilds into Expanding Wilds, the Cutter game that awards falling symbols, Make Up for extra Free Spins and finally the Fix-it game that moves symbols to create winning combinations. The Free Spins feature delivers the most rewarding performance of the Bloopers slot – the Free Spins come with Sticky Wilds that can land you a galactic 185,000 coins. They keep on coming until all three positions on reels 2, 3 and 4 are Wild. This feature can keep bringing in Free Spins, helping you to land wins big enough to put you on the jackpot walk of fame. Are you ready to spin amongst the stars and play for Hollywood riches? If you like Bloopers - You'll like these slots too!